First Things First… What is Jupyter? Lately, I’ve been moving into the Python world where I quickly encountered Jupyter notebooks. They seem like a pretty dominant technology that lets you script python block-by-block and render the results. You can also render data into charts, manage user-interface widgets, and do most anything else. What is the Problem With Jupyter? But Jupyter really just runs on a single machine. What about when you want to share this information to say, teach a class, or work with a team of data scientists? So… We Have Jupyter Hub! Jupyter Hub is a multi-user version of Jupyter… so it fixes our problems! Here I’ll paraphrase content and use images from a wonderful video I watched on YouTube – you can watch it at the bottom of this post if you like. A proxy server to route requests. 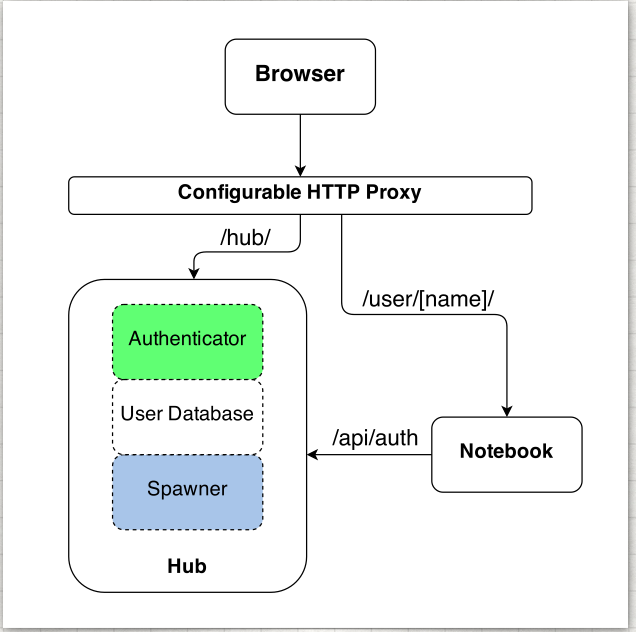 A “hub” which handles authentication, user details, and spawning new notebooks. Authentication is flexible and can most likely tie in your corporate authentication system. Any number of spawned Jupyter processes to run notebooks for the given users. A variety of spawning techniques exist (e.g. spawning to Docker). You can see this architecture below. So, if you need multi-user Jupyter, I suggest you look into installing and trying Jupyter hub, and I highly recommend the video below as a starting point!